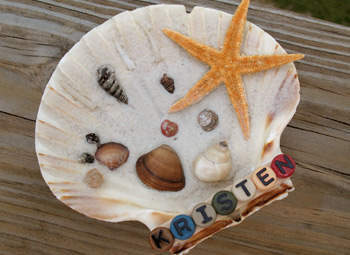 Here’s a great way for kids to save their treasures from the beach all in one place! Display the final product on a bookshelf or nightstand. Squeeze a generous amount of white glue all over the inside of the large shell. Spread the glue with the sponge applicator. For the large item, such as the starfish or a sand dollar, add glue to the back of the item then find a spot on the shell where the item will be fairly flush and stick it in place. Add small shells, pebbles, and anything else you like to the remaining area of the large shell. Cover the entire contents of the large shell with sand. Leave for a couple of hours to dry. Pipe a line of glue onto the craft stick and glue the alphabet beads in place, spelling out your name. Let dry. Gently turn the shell over to dump out the excess sand, Carefully tap the shell to remove all excess. Glue the nameplate to the front of the shell and let dry.